The Fred Rogers Center for Early Learning and Children’s Media at Saint Vincent College will commemorate the 50th anniversary of the first national broadcast of “Mister Rogers’ Neighborhood” by hosting a screening and panel discussion at 7 p.m. Monday, Feb. 19, in the Fred M. Rogers Center at Saint Vincent College. The panel discussion will be moderated by Paul Guggenheimer of Primal Interviews and feature David Bianculli, creator of “TV Worth Watching” and TV critic on NPR’s “Fresh Air”; Dr. Junlei Li, Fred Rogers Center’s co-director and chair of early learning and children’s media at Saint Vincent; and Marge Petruska, retired program officer for children, youth and families at the Heinz Endowments. The program is free and open to the public, but seating is limited. To request a seat reservation, phone 724-805-2750. Established at Saint Vincent College in 2003, the Fred Rogers Center enriches the development of current and emerging leaders in the fields of early learning and children’s media by supporting the advancement and mentoring of child-serving professionals; educational opportunities for undergraduate Fred Rogers Scholars; research and special collaborations by Rogers Center Fellows; and resources and information on the developmentally appropriate use of media to strengthen human relationships. The Center is the official home of the Fred Rogers Archive as well as a straightforward, understanding and compassionate voice for the healthy social and emotional development of children birth to age 8 (www.fredrogerscenter.org). 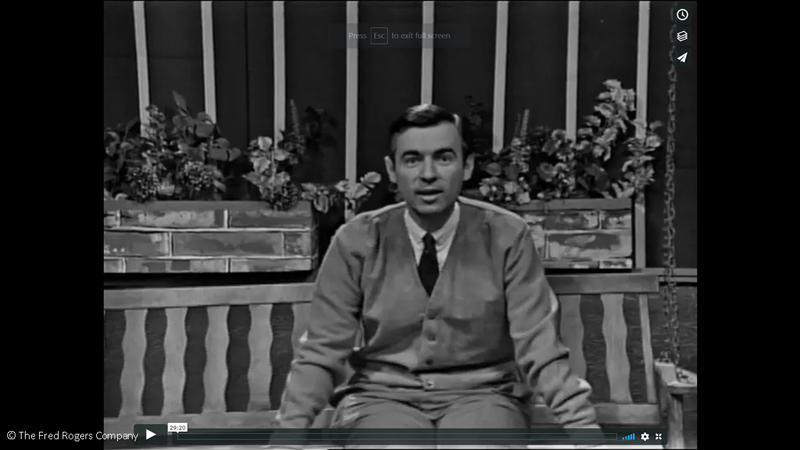 Photo: The late Latrobe native Fred Rogers speaks to children on the first episode of Mister Rogers’ Neighborhood on Feb. 19, 1968.